Lily passed her KC Good Citizens Silver! Lily and I have been training with our local dog club over the last couple of months. 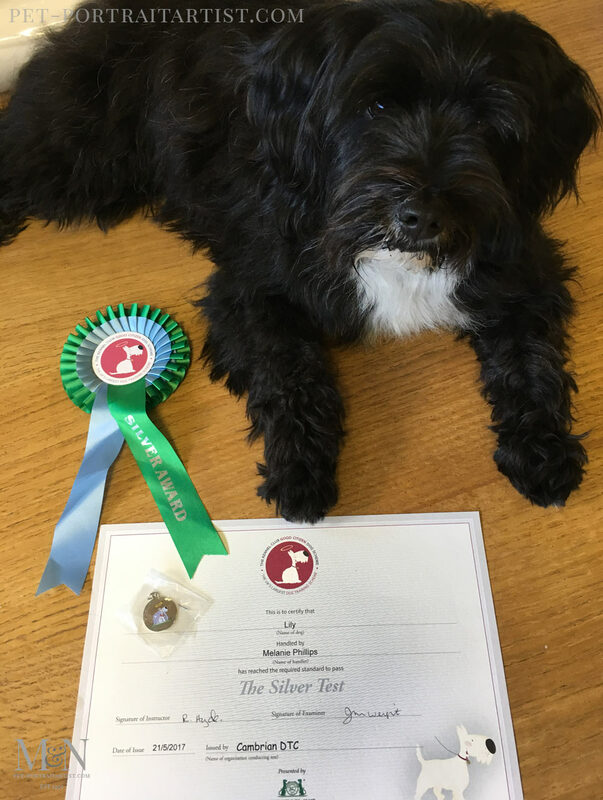 We have been studying the exercises for the Kennel Clubs Good Citizens silver test. We passed our Bronze last year however we all knew this one would be much more tricky! The test day was 2 and a half hours long and we did about 10 different exercises from road walking and crossing with distractions, getting in the car and getting out again, meeting and greeting people without jumping, calling your dog away from distractions off lead, recalls and waits and an individual q&a at the end. In general, making sure the dog was safe and under control and well behaved. There were two examiners and in one particular test. One examiner sat on a chair the the field and held a biscuit in his hand while the other stood back to observe. We had to walk with the dogs up to the man in the chair. Then walk around him and then sit our dogs in front. They weren’t allowed to lunge or steal the biscuit. Lily was pretty relaxed while waiting her turn. Her nose isn’t all that good…I don’t think she could be a sniffer dog! So I thought she would be ok, but as soon as she could smell the biscuit she was very interested, trying to pulling towards him. When she sat in front of him she literally started right at him…willing the biscuit to come her way. I looked at the examiner and she smiled and said, “She is staring him out!” She didn’t seem to think it was a problem though so we passed that one! The exercise I was most worried about was the two minute wait. We stand 5 paces away while they sit, stand or lay in one position without moving. If they move its an instant fail. I have been practicing this over the last two months but it has been tricky getting her to sit for 2 minutes. Lily doesn’t particularly like laying on wet grass and its often a bit soggy living in rainy Wales! My ideas was to use a towel during the test. They said yes! So on the last practice day, I took a towel and as soon as I produced it from my bag, she was jumping up and couldn’t wait to sit on it. So I think all that time she just didn’t like to lay on the wet ground! She is a lady after all! So in the test she laid on the towel as good as gold…and didn’t even get up once that test had completed, she laid there enjoying being comfy! It was a long day and well worth al the effort and we all passed. Apparently the examiners said that it was unusual for a whole club to all pass and that we were at a very high standard. We have been working really very hard so we were all delighted. I took a photo of Lily with her rosette which you can see below. Rocket my Jack Russell eventually achieved bronze, silver and gold having been told “you can’t train a Jack” I was so proud but sad that the classes came to an end. She’s 14 this month and we’ve enjoyed a lifetime of not just good behaviour but also pride, love and obedience.